Voluntourism, the combination of volunteering for a cause while on vacation, takes a special kind of person. For these altruistic individuals, it’s less about the giving of time, labor, and money, and more about the rich reward of improving the world for its citizens. With thousands of volunteer vacation opportunities available worldwide, these tips may be helpful to pinpoint the right experience for you, and ensure a successful, enriching adventure. 1) Visit www.VolunTourism.org for tips on selecting the right program for you, preparing for your trip, and what to do once you’re home. You can choose to join a volunteer-sending organization, or find an independent opportunity. 2) Check out the International Volunteerism Resource Center pages of www.idealist.org for suggestions and resources specific to volunteering in a foreign country. 4) What’s included in my fee? This won’t be a free vacation, so find out it your fee goes directly to the cause involved, or administrative overhead. 5) Is transportation to the site provided? Will you be responsible for traveling to the location, or to a central meeting point? 6) What’s included once I get there? If meals are included, inquire if you have dietary restrictions. Get specifics about whether your lodging will have heat, running water, bedding, etc. 7) What do I need to bring with me? An itemized list should be provided of any gear you’ll need to supply, like a tent, sleeping bag, hiking boots, etc. 8) Look for discounts. Some volunteer tour operators run specials, such as G.A.P. Adventures’ (www.gapadventures.com) 10% discounts during Earth Month. 9) Create your own volunteer experience. You don’t have to go through a tour operator or a charitable organization. If you see a need, offer to help. 10) Do it for just a day. You don’t need to make a huge time commitment. Join a “cleanup” in the community you will be visiting. 11) Bring the family. Certain programs offer suitable, educational, and character-building experiences for school-aged children. 13) Help the environment. The International Ecotourism Society (www.ecotourism.org) provides information on specifically ecological voluntourism vacations. Also try the Sierra Club (http://sierraclub.org/) and the Oceanic Society (www.oceanicsociety.org). 14) Help wildlife. Volunteer to monitor and count threatened species. Earthwatch Institute (www.earthwatch.org) arranges expeditions around the world. 15) Sign up to help the sick. Camp Sunshine in Maine (www.campsunshine.org) provides respite to children with life-threatening illnesses. Volunteers help with food service, arts and crafts, recreational leadership, and child care. 16) Be a part of disaster relief. The American Red Cross (www.redcross.org) keeps a list for volunteers able to deploy on short notice. American Humane (www.americanhumane.org) similarly calls on volunteers for animal-related disaster relief. 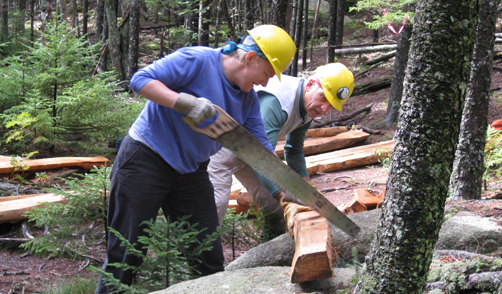 19) Improve hiking trails by joining a trail building or rehabilitation project, widening and blazing paths, constructing foot bridges, or clearing brush. Start with a local hiking club, or the American Hiking Society (www.americanhiking.org). 20) Take pride in America. The country’s historical and national treasures need help with upkeep and staffing. Check out the Take Pride in America’s (www.takepride.gov) online database, searchable by state. 21) Handy with a hammer? The Heritage Conservation Network (www.heritageconservation.net) arranges hands-on workshops for architectural and site conservation around the world to restore and repair historic buildings. the acclaimed installation of one hundred bonfires set on Providence’s rivers. Here’s where you won’t find freelance writer Traci L. Suppa: zip lining in the Costa Rican rainforest; snacking on toasted crickets in Thailand; or snowboarding down Mount Kilimanjaro. More likely, she’ll be riding shotgun in the family minivan, playing “I Spy” with her two children during a day trip through her Hudson Valley backyard. Get to know her “back-to-basics” approach to travel at http://www.wordscapesny.com, or follow her on Twitter: @WordScpaes Make sure to check out her 52 Tips for Voluntourism here https://52perfectdays.com/travel-tips/voluntourism-52-tips.